They say, in show business, you should never work with children or animals. Apparently, Gregory Popovich didn't receive that memo. Celebrating his ninth year in Las Vegas, the international circus star features more than 30 animals in his show at the V Theater in Miracle Mile Shops at Planet Hollywood. Your great deal on Las Vegas Gregory Popovich Comedy Pet Theater tickets from VEGAS (the app) offers you the opportunity to see everyday pets acting out amazing scenarios such as patients in a doctor’s office, passengers waiting to board a train and students in a classroom. The animals, which include dogs, cats, doves and mice, have all been rescued from pet shelters across the country. Popovich also incorporates world-class juggling, gymnastics, and incredible balancing acts into the 60-minute show. The winner of several international circus competitions, Popovich is a fifth-generation Russian circus performer and has toured with the Moscow Circus and the Ringling Brothers and Barnum & Bailey Circus and performed at Circus Circus in Las Vegas. 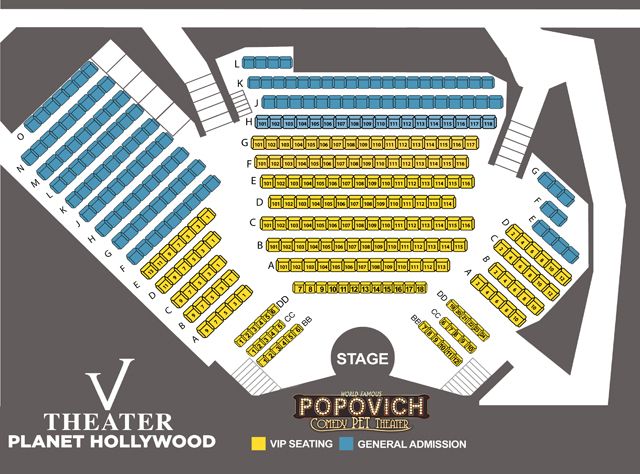 Named “Best Family Show in Las Vegas,” Popovich Comedy Pet Theater has wowed audiences in more than 20 countries including France, Israel, Chile, Mexico, Colombia, Germany, Belgium and Holland over the past 15 years. The veteran entertainer and his furry friends have also been featured in People Magazine and The New York Times Sunday magazine and made guest appearances on “The Tonight Show with Jay Leno,” “Late Night with David Letterman” and NBC’s “America’s Got Talent.” In 2009, Popovich released his first book, “You CAN Train Your Cat.” Get a great price on your Las Vegas Popovich Comedy Pet Theater tickets from VEGAS (the app) today for an afternoon of fun that is perfect for the whole family. All guests must have a ticket to enter the theater regardless of age.